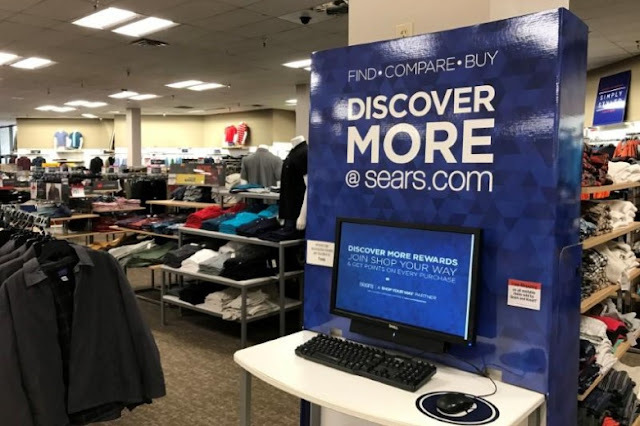 An online shopping kiosk is shown inside a Sears department store in La Jolla, California, U.S., March 22, 2017. CHICAGO - U.S. online retail sales will surpass $1 trillion by 2027 compared with $445 billion this year, according to a forecast by business advisory firm FTI Consulting Inc, as more Americans move away from brick-and-mortar stores. Online sales will grow at a compound annual rate of 12 percent through 2020 and at a relatively moderate 9 percent over the next decade, according to the report released on Tuesday. Purchases made online accounted for 12 percent of total U.S. retail sales and 50 percent of total sales growth in the past year, according to the study. FTI said Amazon.com Inc’s total share of these online sales is likely to increase to 53 percent by 2027 from 34 percent in 2016. This means Amazon’s share would represent nearly 12 percent of U.S. retail sales by 2027 compared with 4 percent at present. This year, stronger online business is once again expected to boost total sales for the U.S. holiday season, a period which typically accounts for 20 to 40 percent of annual sales for many retailers. U.S. retail industry group the National Retail Federation has forecast nonstore sales, which include online sales, to rise 11 to 15 percent to about $140 billion during the last two months of this year. In 2016, those sales rose 12.6 percent. U.S. online retail sales will surpass $1 trillion by 2027 compared with $445 billion this year, according to a forecast by business advisory firm FTI Consulting Inc, as more Americans move away from brick-and-mortar stores.